Glenayre is a charming community in the city of Port Moody, British Columbia, and is a popular community with families and retirees. The name Glenayre is Scottish, and all but two of its streets are also names of places in Scotland. The first phase of Glenayre development was approved in 1956. Most of the homes have been built in the last forty to fifty years. The Glenayre development is located between Clarke Road and the east slope of Burnaby Mountain. The first homes in Glenayre were constructed in the summer of 1957. One of the first residents of the neighborhood paid $17,000 for their home. The lowest price paid was $13,500. The name Glenayre is Scottish and was selected by the wife of one of the developers. Names of the streets in the community are Scottish as well: Caithness, Dundonald, Eildon, Balbirnie, and Allandale. Glenayre has a temperate climate with an average annual temperature of 10.4 degrees Celsius. Glenayre is about 15 minutes away from Coquitlam Centre, Lougheed Town Centre, and Como Lake Village Shopping Centre. Port Moody Winter Farmers Market has become a popular shopping spot during the winter months. Port Moody has more than 60 restaurants to choose from including fast food, coffee shops, pubs, and fine dining. For those preferring ethnic foods Indian Thai, Japanese, Spanish, Mexican, Italian, and Mediterranean cuisine are all available. Moving about Glenair is easy with so many transportation options. The 97-B express bus runs north and south on Clark Road every 7 Minutes during peak times. The bus travels to all major destinations in Coquitlam where residents can connect with SkyTrain, Vancouver's Metropolitan rapid transport network rail system. The West Coast Express commuter train is another option stopping in Port Moody station 5 times westbound to Vancouver in the morning and 5 times Eastbound in the afternoon. Nice wide highways are available for those who prefer to drive to work. Additional lines in each direction are specified for buses and carpool vehicles during rush hour. Downtown Vancouver is about a half hour away. Students in Glenayre attend schools in School District #43. Excellent schools are available in the area of Glenayre with some of them being French immersion schools. 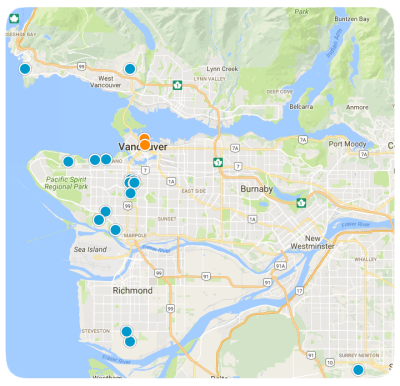 Post secondary schools Simon Fraser University in Burnaby and Douglas College campus in Coquitlam are just a few minutes away. Popular festivals in Port Moody include Golden Spike days in July, the Festival of Arts and September, and the Canadian Film Festival in February. Glenayre is predominantly residential, with a mix of townhomes and single-family homes of varying styles and sizes. Townhomes start reasonably priced and climb to seven figures for those in highly sought-after locations. Listing prices for single-family homes in Glenayre start low and also can reach seven figures for mansions with the finest amenities. Contact us today to see any of our beautiful homes in the community of Glenair or any surrounding neighborhood of Port Moody, British Columbia.